For a bright complexion and even skin tone, there's one natural wonder you can add into your skin care routine - Vitamin C! 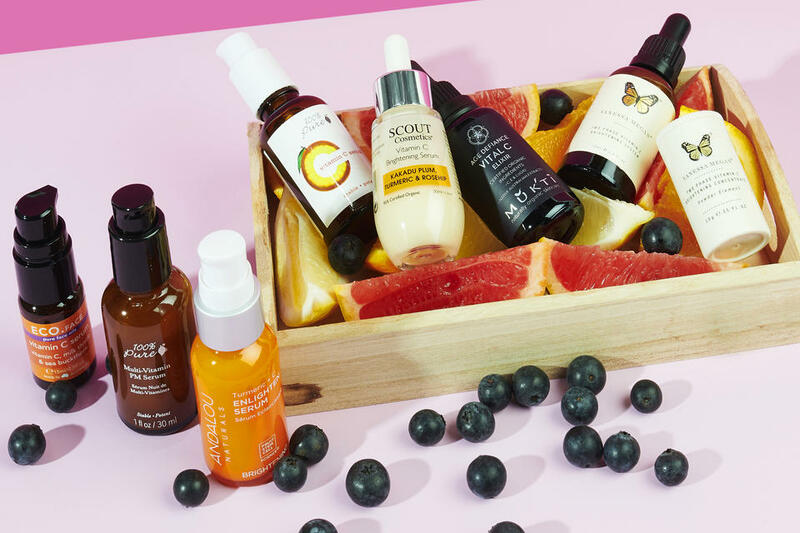 A perfect addition to your daily routine, natural skincare with Vitamin C is packed with anti-ageing goodness, so I have put together this guide to our favourite Vitamin C serums. We all know how great Vitamin C is for our bodies. A powerful antioxidant, when taken internally Vitamin C is known to provide a whole range of health benefits, but did you know about all the incredible things Vitamin C can do for your skin as well? It is actually one of my favourite active skin care ingredients because of its amazing anti-ageing benefits, including targeting pigmentation and wrinkles. Vitamin C can be easily added to your regular skin care regime, just add a Vitamin C serum to your into your daily skin care routine for an easy boost of skin-loving nutrition. 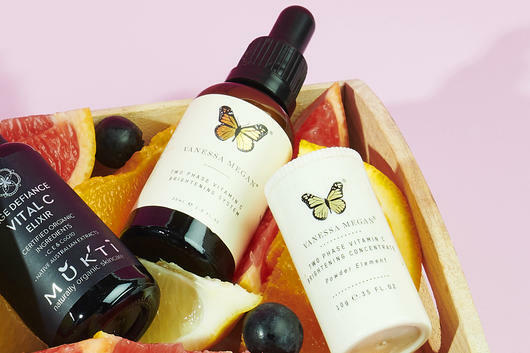 In natural skin care, Vitamin C is an anti-ageing wonder! One of the greatest benefits of Vitamin C for skin is its powerful brightening abilities. 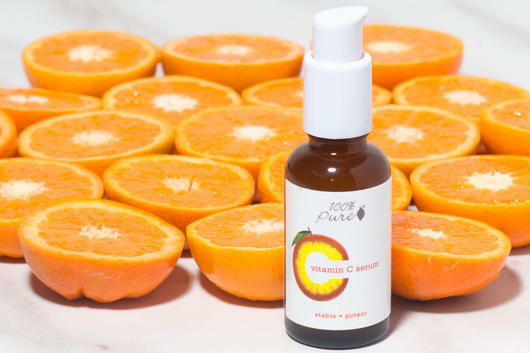 Vitamin C is actually known to help brighten the overall complexion and help give damaged skin a beautiful even tone, which makes it perfect for targeting age spots and environmental damage as well as dark under-eye circles. Vitamin C is also known to help boost your skin's natural collagen production, as it is essential in the formation of collagen. 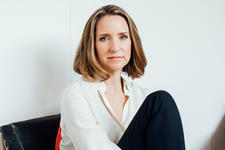 This means it Vitamin C serums can help plump mature or dehydrated skin and can be used around fine lines and wrinkles. 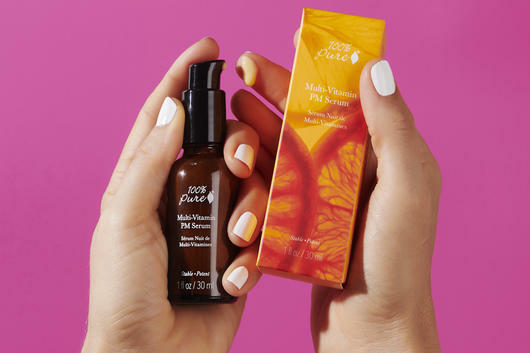 One of my all-time favourite natural Vitamin C serums is the 100% Pure Multi-Vitamin + Antioxidants Potent PM Serum, suitable for all skin types including mature skin. This overnight (PM) treatment contains a whopping 10% pure Vitamin C, in the form of Magnesium Ascorbyl Phosphate, which is actually known as the highest quality, most stable form of Vitamin C. Designed to brighten skin, target sun damage and pigmentation and even out skin tone, this formula also contains 10% Niacinamide, 10% Vitamin E, 1% Retinol and 1% CoQ10 in a pH-stabilised concentrate. Recommended for use at nighttime only due to the active ingredients - apply all over the face and neck, including the eye area. 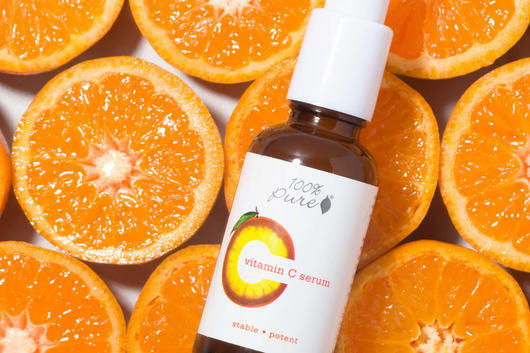 Ideal for use both morning and night, the 100% Pure Vitamin C Serum contains concentrated Vitamin C in a nourishing base of Vitamin E and Aloe Vera to help target age spots and sun damage, while Willow Bark and Witch Hazel may help to soothe breakouts. This lightweight serum can be used by all skin types include those prone to breakouts, but may especially be suitable for those wanting to target the first signs of ageing and help fight the future signs. 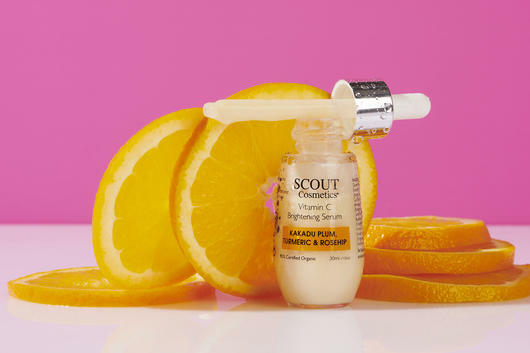 The SCOUT Cosmetics Vitamin C Brightening Serum is packed with Certified Organic Kakadu Plum Extract, which is naturally incredibly rich in Vitamin C. This Australian made serum also contains brightening Turmeric and Rosehip, both known for their anti-inflammatory properties and ability to rejuvenate skin, in a base of soothing Aloe Vera, making this formula ideal for all skin types. Use morning and night, following with your usual moisturiser. 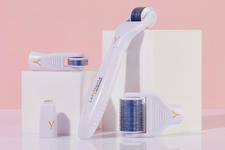 For a natural salon-style treatment at home, try the Vanessa Megan Two Phase Vitamin C Brightening System. This unique system includes a Brightening Concentrate Powder and Vitamin C Serum, designed to help brighten skin and target collagen and pigmentation overnight, thanks to potent natural Vitamin C from Kakadu Plum, Cranberry and Bearberry. To use, place a small amount of the powder in your hand, adding 3-6 drops of serum. Mix together and apply to face and neck after cleansing but before moisturising. Boosted with Andalou's Fruit Stem Cell Complex, the Andalou Naturals Turmeric + C Enlighten Serum combines Vitamin C, Turmeric, Sea Buckthorn and Rosehip which may help brighten the complexion as well as evening out the overall appearance of our skin tone. Ideal for dull and dry skin, this lightweight serum can be applied to a clean face and neck before moisturising. Made with Certified Organic ingredients, the Mukti Age Defiance Vital C Elixir is a powerful concentrate enriched with native Australian extracts such as Kakadu Plum, Finger Lime Caviar and Desert Lime designed to help stimulate collagen production, smooth skin and target discoloration. Naturally rich in Vitamin C and skin-loving antioxidants, this Australian made formulation is ideal for those with mature skin, to use, gently press into the face and neck each morning after cleansing.